Red cooking is a very common technique in Chinese cuisine. This technique is used throughout China and can be employed with many types of meat including pork, chicken, beef, lamb and fish. 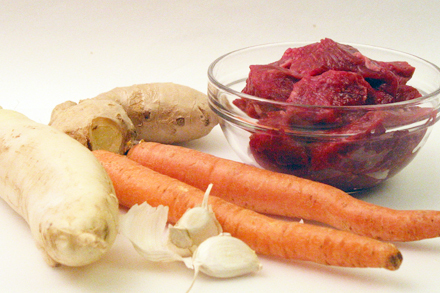 The common ingredients for red cooking are garlic, soy sauce, Shoaxing cooking wine and sugar. To this base additional spices are added depending on the meat and region. 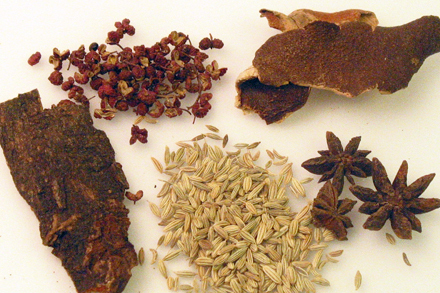 For red cooked beef the addition of ginger and star anise is very common. Regional variations can include other spices such as Sichuan peppercorn, cassia bark, fennel seeds, dried tangerine peel and dried chili. An important factor for the success of this dish is the selection of the cut of meat. Beef tendon and beef shin are best for red cooking. They are almost always available in Chinatown or Asian markets, although not necessarily in regular markets. As a substitute I would recommend using beef short ribs. Remove the bones from the meat and cut into one-inch cubes, but be sure to have enough meat to make up to about 1 lb. As a last resort you can always use stewing beef. Unfortunately it is often too lean for red cooking and will result in a rather dry meat dish. The recipe I selected for this post is from Sichuan, hence the use of many aromatic spices typical of Sichuan dishes. 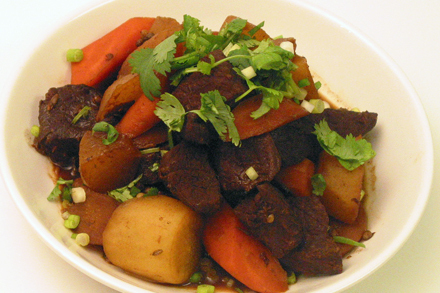 You can cook the beef until the braising liquid is reduced to a sauce and serve with rice. Alternatively you can add additional beef stock to make a soup to which you can add cooked noodles to make a complete meal. My neighbor, Rachel, will be very glad to know that I am writing a post on red cooked beef. She is Jewish and her husband, Jaffer, is Muslim. They’ve not been able to enjoy the red cooked pork I so often make. So Rachel, here is the recipe especially for you. Put the beef into 5 cups of boiling water for about 10 minutes. Remove any scum from the top of the liquid then drain the meat. Par-boiling the meat will make sure that no more scum will form on top of the braising liquid. To the meat add the rest of the braising ingredients and simmer covered for two hours. You can wrap the spices in a cheesecloth or bouquet garni bag for easy removal. The key to red cooking beef is the long period of braising. Be sure the liquid does not completely evaporate before the meat is tender. If the liquid is reduced before the meat is tender then add more water to prevent it from scorching. When the meat is tender add the carrots and daikon radishes. Mixing well so the root vegetables are fully immersed in the liquid. Continue to cook on medium heat until the vegetables are tender and the liquid has reduced to a sauce. About 10 minutes. Serve hot garnished with chopped scallion and cilantro. You top Superman, Spiderman, and Green Latern in my list of superheros. I can’t wait to try this. And Jaffer will be forever grateful. I really recommend this recipe to anyone who can’t eat pork. I did secretly try the pork one day and it was mouthwatering. So this should be a great way to enjoy the flavor without the guilt! Michele, I love the version for the noodles also. It is actually common to add a little bit of Sichuan hot bean paste during braising for making the noodles dish. Rachel, I’m sure you’ll enjoy this recipe. You’re welcome. Thanks so much for posting this – I made this the other day for the first time in my life, and it turned out great. Yay! I can do this myself! No need to pine away, waiting for my next trip to China. BTW I used beef shin (shank), which I bought at my local Whole Foods. Yesterday I checked at Stop & Shop, and they too had shank. The meat was incredibly tender, not dry in the least. Great suggestion for braising beef. Susan, I’m so glad you’re enjoying this recipe. Beef shin is really great for red cooking. Keep cook’n! I tried to make this dish last weekend and it came out very bitter. I’m thinking it may have to do with the fact that I used too much of the herbs. Since I cooked twice as much meat as the recipe calls for, I used twice the amount of the ingredients in my braising cheesecloth. Is that the mistake? What else could cause this result? Doubling the spices for a double recipe should not make this recipe bitter. Did you use the dried tangerine peel or fresh citrus peel? If you use fresh orange or tangerine peel you should remove the white pith. Scrape off as much of the white stuff as possible. The pith will make the stew bitter. Otherwise I don’t see why any of the other ingredients would make your stew bitter. I’m currently making this. 1.5 hours to go, though, so it’s too soon to say if I’ll be successful. It smells really good so far, at least. Here it’s rare to find tendon/shin/shank of anything in the supermarket. But chuck roast is available everywhere, so I tried that instead. I hope my dried tangerine peels will work out all right too. Eating tangerines isn’t exactly a chore, and drying the peels afterwards is easy enough. Just one question. In the text you mention garlic, and there are two cloves in one of the images. But it’s not in the recipe. So, should I or shouldn’t I? Oh well, I think I’ll pop one of those solid garlics in the pot whole just to be on the safe side. until I find a brand that is not acrid; this however may not be possible, because I believe that the darkness is basically created from burnt sugar. Kian – I live in Beijing and want to find the correct cut at the market. Can you include the characters for the beef tendon/shin cut? Nate, Beef tendon is 牛腩 and beef shin is 牛健. I hope this is helpful. Good cooking! I have been looking all over for translations of popular meat cuts (lamb, beef, pork, chicken) so I can better communicate with the butcher – do you know of an online resource where one can find such a thing? I have never been able to locate one. Translations of cuts like short rips, rib tip, flak, lamb rack, etc. Unfortunately I’m not aware of a site that offers complete translations of meat cuts. It is possible to search specific cut individually. Perhaps I will put together a list and write a post. So you don’t carmelize the beef in a sugar/oil mixture first, like you do with pork? Yes, that is correct Max. Pork belly is the only meat during red cooking that sugar is caramelized. I am not aware of a particular reason why this is. But probably the pork flavor is enhanced with this caramel taste more than with other meat. the recipe sounds great. if you dont like carrot etc you can add some Chinese style sauerkraut or Preserved mustard greens and chilli bean paste. also very nice if you do noodles with beef stock with it.